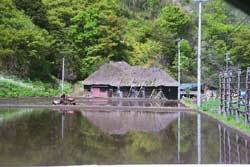 A small farm in Iwate prefecture uses modern machinery, but may not have a successor. Photo Courtesy of Sebastian Blanco. Traditionally, a farmer in Japan usually passed on his land rights and livelihood to his eldest son. Over time, the mechanization of agriculture made the smallest of these farms unsustainable, but farmers were not allowed to acquire more land than the 1946 limits. Most Japanese farm households cultivate less than two hectares, or five acres, of land. They usually derive only part of their income from farming, and many do not have a family successor to take over the farm when the current older generation retires or dies. Two-thirds of Japan’s farmers are now over 60 years old, and half of all farmers are 65 or older. There are also a substantial number of non-commercial farm households in Japan who grow crops for their own use but do not market them. Click on CHARTS, below, to learn more about Japan's farm population.